Petal Talk: Think You're An Impatient Gardener? 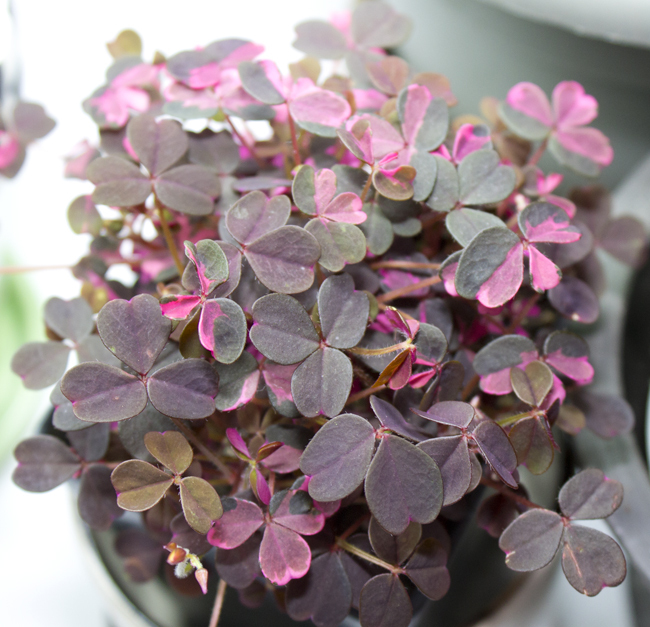 Think You're An Impatient Gardener? 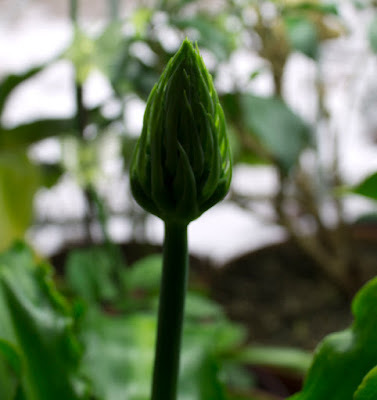 If you've ever wondered whether you're a patient or impatient gardener, try growing houseplants in the winter. Even with lights on a 16 hrs on/8 hrs off timer, a heat mat, and frequent grooming and inspection, growth is painfully sluggish. Well before the Slow Food movement, the slow houseplant crusade had already written its very own, very literal, manifesto. Hippeastrum 'Razzle Dazzle' inspiring me in my writing room. Like a kid on Christmas morning, I head immediately to the room where my plants are, a banquet table covered with an inexpensive plastic tablecloth beneath bars of lights strung from cords. Like my outdoor garden, it's more laboratory than it is landscaped. The good news is that the blooming plants' flowers last a very long time. The bad news is that they seem to take forever to flower. I'm watching a slow-moving romance instead of an action flick, which I much prefer. So I've been making up for the lack of activity with the addition of new plants. When that fails, I play with my plants--which for the most part means I prune them, clean their leaves, and take their photos. This bulb's flower has been in a holding pattern for six weeks. It's so embarrassed, I've had to disguise its identity. On ambitious days, I drag out the plant accouterments and repot them. This is a dicey operation in the middle of winter, though, because even with the lights, the roots don't grow that fast either! I'm waiting at least another month, when the days will be longer, before graduating any plant to a larger pot. There is no doubt that the lights are encouraging my plants to remain green, perky and alive. I've set the table up against the south windows of the room, so their growth is also subject to day length. Episcia 'Alice's Aussie' in her plant sauna. 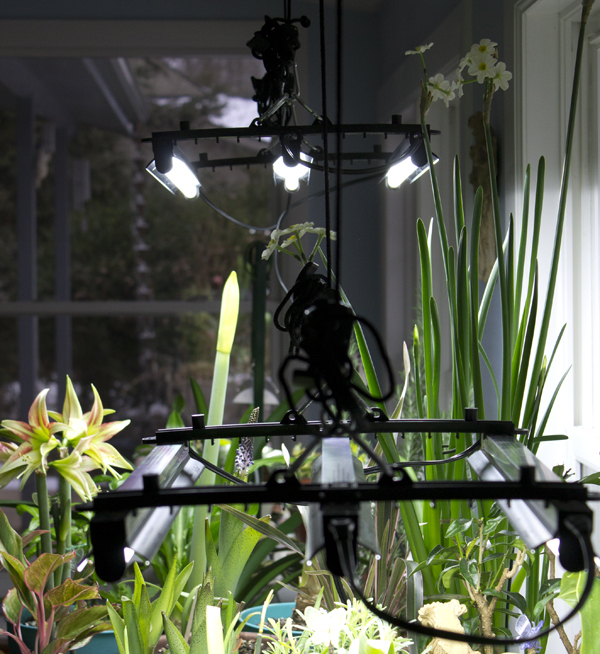 Plants are grouped by light and heat requirements. And then there is height. Some pots are perched precariously on top of upside down vessels in order to keep them from becoming shaded out by their taller neighbors. Some are too tall to keep under the lights and are relegated to another room in the house. 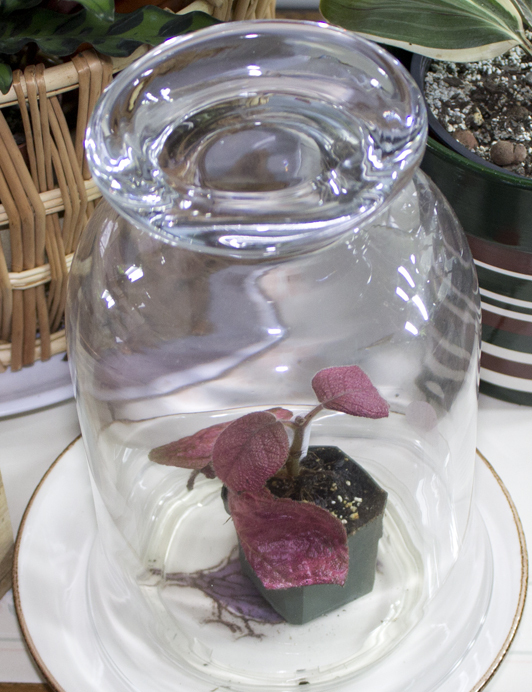 Even more so than garden plants, houseplants are in-your-face humbling. You've let them into the house, for one thing. And there is no getting away from them. With the elaborate setup I've devised, I'd damn well better be successful. And I have been, for the most part. So far, I've killed an Episcia, and have successfully nursed a tragic Begonia back to health. 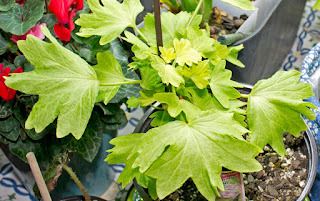 Another Begonia is still in intensive care. I've learned that some need to be left alone in order to strengthen their spindly stems. I've replaced the dead Episcia with another of a different variety called 'Alice's Aussie'. Inspiration for this exercise has been the books that display beautiful plants in imaginative and lovely containers "effortlessly" placed throughout the house in little vignettes. Two of my favorite books have been The Indestructible Houseplant, and The Unexpected Houseplant, both by Tovah Martin. Unfortunately, this whole "houseplants as decor" thing requires clearing off a table or some other spot in the house where plants are viewed to their best advantage. me know I'm doing something right. And here is the ugly truth--my house is a mess. Although far from being called a hoarder, I'm definitely cavalier about where and how I leave things. There are boxes on the floor with catalogs and magazines and books on top of them. A laundry basket holds clothes I washed last September and won't need again until May. They're held in place with books and then a layer of clothes I plan to take to the resale shop. Our house is too big for us, apparently, as I only spend time in three out of the seven rooms (not counting bathrooms) that make up our 60s-era ranch. And those three rooms are heavily lived-in. I could put plants in the other four rooms, but since I don't spend time in them, there is little point. So I'll create my vignettes in situ, occasionally bringing them into the room where I write. For inspiration, or simply to give me something to feel good about. And isn't that the basic reason for growing them? I absolutely love this post. I can so identify with it. I keep my plants mostly in the living room and kitchen. If I had better light in other parts of the house I would have more indoor plants. 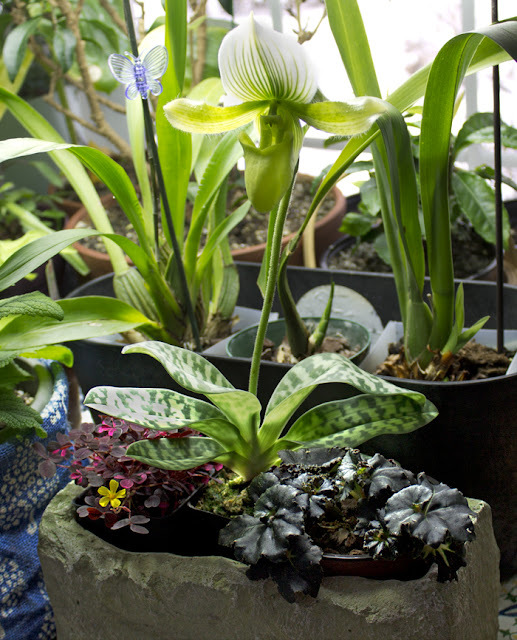 Your line 'Like my outdoor garden, it's more laboratory than landscaped" makes me smile. During winter my house is more greenhouse than home. 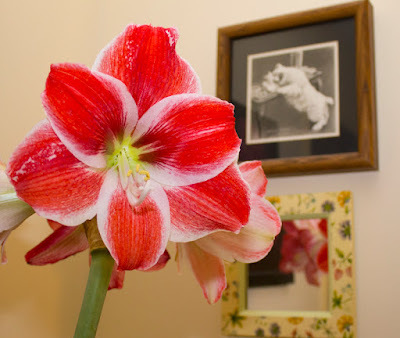 When friends come over, if given a heads up before arriving, I place plants around the house in places they would never make it through the winter if they were there all the time to show off their blooms or lovely leaves. My niece who lives far away is usually only here during November when the house if full of plants once visited during summer. She made mention that my house seemed so much larger during that visit and couldn't figure out what it was. ha... I knew exactly what it was...the plants were all outside. Carry on, enjoy your plants and home. Sounds marvelous to me. Hey Lisa, It sounds like you've been at the inside gardening longer than I have. It sure is great for getting through the winter!